If the word is ‘energy’, the adjective to go with it is ‘small’. Electrical engineers at the University of Michigan have built a device that takes up less area than a cent and can produce electricity from vibrations. In doing so, they have created a machine with the highest efficiency per unit are than any other machine ever built. 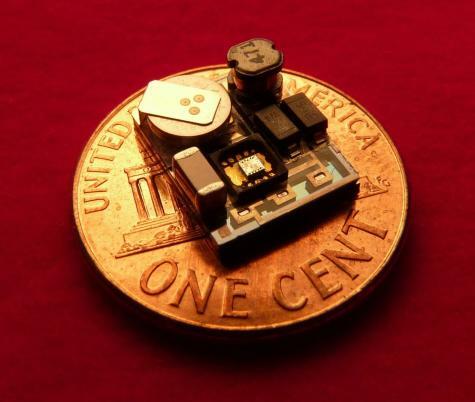 The secret to the design is the use of an ultra-small piezoelectric crystal. Piezoelectric materials have the property that they can produce electrical power is they are subjected to mechanical stress. Thus, if such a crystal is vibrated, it will send out tiny electrical signals. This is expected to find wide application in wireless sensor networks. If one were to look at the ongoing life-cycle expenses of operating a wireless sensor, up to 80 percent of the total cost consists solely of installing and maintaining power wires and continuously monitoring, testing and replacing finite-life batteries. The active crystal sector of the device measures a mere 27 cubic mm. The energy produced by this tiny energetic heart is then used to charge a small powerful capacitor. The system works at 155 Hz, which is the vibration frequency for most electronic devices, with a generous bandwidth of 14 Hz. The device is to be exhibited by the researchers at the 16th International Conference on Solid State Sensors, Actuators and Microsystems to be held in Beijing in June. The device is expected to be mass produced in a very short time. The potential is immense. This will be virtually indispensible for medical devices like pace-makers. Tiny is big, as long as the energy is renewable.